My guru is Sri Venmani K.Kumar, lovingly called guruji and more often just Ji! His life so far has been an amazing journey which I would like to share with you. He was born as a fifth child to his parents among their twelve children. His father was uneducated and through some chance found employment with the then Madras Telephones and brought up his kids with considerable difficulty. His mother for her part worked as a construction worker to supplement her husband’s income. His father was a strict disciplinarian and a God fearing man. He wanted his son to get good education since he did not have one. But my guruji was very averse to studying. He was an atheist as well. Being a very argumentative person as a teenager, quarrelled with his father and left home. He took up all kinds of odd jobs to survive. He had a flare for writing plays. Even as a young lad he had written and staged a play in school. So he took refuge in Kodambakkam. He was an errand boy, a courier, a copy writer, an assistant director, struggling to make a mark in life. He had an opportunity to go to Union Motors on some errand and applied for a job there. As luck would have it he did get a job with their sister concern Hydraulics Limited. This was a turning point in his life. His status immediately improved as he had a permanent posting. His father waiting for such an opportunity immediately found him a bride and got him married. Finding just the right life partner is a great blessing. His wife Kalaivani was exactly who he needed to steer his life in the right direction. He lives in Nungambakkam in the same place where his father lived. He reconstructed his father’s humble abode into a concrete construction for which he had to take a big loan at that time. His wife ably managed the household expenses with the meagre amount he gave her after his repayment of the debt every month. He successfully staged a single act comedy play during an office cultural event and earned the praise of his colleagues and superiors. This boosted his self confidence. He was fearless, frank and always spoke the truth without ever mincing words. He grew up in a poor neighbourhood where people did not realise the value of education, were addicted to bad habits and were petty and quarrelsome. But he owes his good character to the strict upbringing by his father. He is ever so grateful to his father for having raised him in such a fashion. To bring up some one with clean habits may not be a difficult task for a parent who belongs to a middle or upper class but it is a monumental feat for some one who lives in the poorer sections of the society. 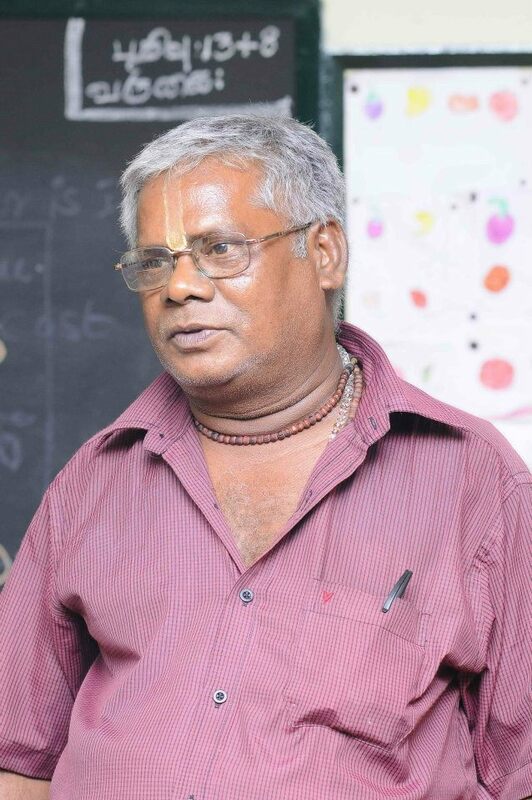 In Hydraulics Limited he found a mentor by name Sri Mannu Perumal. He considers him to be his first guru. Sri Perumal used to arrange group trips to Tirupathi. Sri Perumal made sure that my guru did not fall into bad company and made him interested in spirituality. My guru has mentioned that in a fraction of a second he became a believer from a non believer. I do not know what exactly brought about this transformation but he transformed. One who was engaged in spreading the teachings of Periyaar by speeches on stage, found true solace in Lord Krishna. He started his spiritual search and this quest took him to established institutions like Chinmaya Mission, Ramakrishna Mission and Iskcon. When he did not find the right answers there he also went in search of individual gurus and sidhars in forests and hill tops to get their advice. His love for Kannan is akin to the love displayed by the Azhwars. His motive was social service but it started as a religious service. He lives near the pottery sale section on Kodambakkam High Road. His first priority was the upliftment of the kids in his neighbourhood. Due to his great passion for the language Thamizh and his unadulterated love for Krishna he learnt Thiruppavai and then Naalaayira Divyaprabantham. He then taught this to the kids in a way that they would understand. He would offer snacks to the kids to entice them to attend his class. Yet it was difficult to retain them. But through hard work, perseverance and helping those around him he earned the goodwill of his community. His work started reaching those whom he intended should benefit. 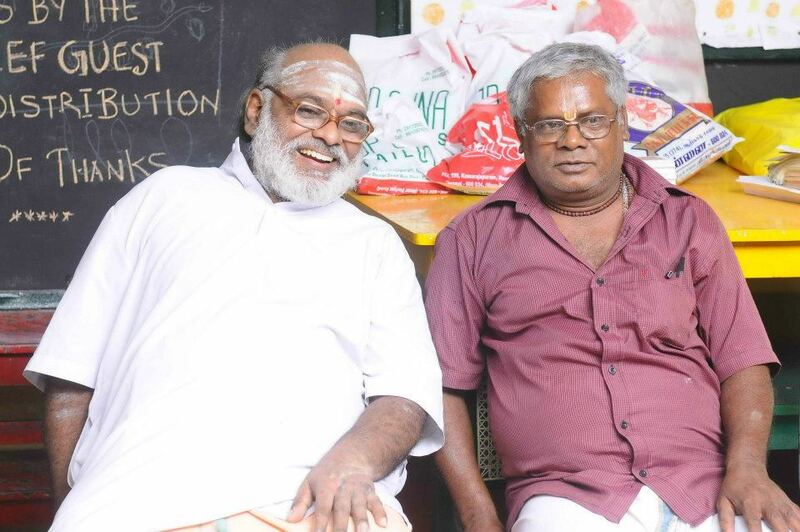 Sri Easwaran, a devout Saivaite is another guru who taught him several scriptures and is till today instrumental in encouraging him to do the social work that he is doing. He is responsible for unearthing the hidden talents in my guru. I have met him. He is a personification of simplicity and compassion. Though my guru’s heart and soul was filled with Lord Krishna he learnt the Saivaite philosophy and various religious teachings under his tutelage. At that time he wanted to give his teacher guru dhakshana and was wondering how he was going to do that. He happened to mention to his guru that there was a Ganesha temple near his house which was totally dis-functional and in a state of disrepair. His guru immediately told him that he should take up the responsibility of running the temple as a form of guru dhakshana to him. My guru could not but obey his orders. So in addition to his regular work, he took on the responsibility of maintaining and running the temple as well. The temple was in a really bad shape. The idol of Ganesha was covered with bugs and insects. The temple’s ceiling and walls were also covered with crawling creatures. With great difficulty he cleaned the temple premises and also got rid of those who were using the place as a gambling den. But it was putting a financial pressure on him as the upkeep of the temple was eating into his income. But good work never goes unrewarded. Mr.MGR’s brother-in-law (Mrs Janaki Ammal’s brother) who used to pass by that temple everyday saw the transformation done to the temple by my guruji and made a monthly contribution of Rs.200 towards temple expenses. This was very helpful to my guru. As devotees started patronising the temple and a small collection started trickling into the Hundi, it also attracted the bad elements in that place. They wanted to take away the contributions received by the temple. But my guru is a very strong personality and will never bow down to unjust pressures. He made them leave the money alone and used it for temple expenses. Sri MGR being the chief minister at that time also helped my guru to keep them at bay. He started learning Bhagavad Gita from Parameshwara Prabhu of Iskcon. He then went on to his next guru Sri Ramakrishnan. Sri Ramakrishnan was professionally in a very good position when he tragically lost his only son. He and his wife were so heart broken that they locked themselves inside their home in grief. A Swamiji from Sri Ramakrishna Mission took the initiative to give them counselling and made them come out of their shell and start doing service to the society. My guru along with a few others started learning Gita from him. Initially it was quite difficult for him to follow Sanskrit and many times Sri Ramakrishnan would offer explanations in English which was also hard for him to follow. But my guru is endowed with amazing perseverance and through the grace of the Lord and his guru mastered the essence of Bhagavd Gita. This is not very surprising as it was the wish of the Lord that my guru become the teacher for many others. Looking at him singing Bhajans on Krishna and chanting stanzas from Prabandham in front of Ganesha, a devotee one day took him to Mahabalipuram to one of the sculpting places. He made him choose a Krishna statue among the many there and bought it and brought it back to the temple. All this happened in a matter of few hours. My guru then found another sponsor to construct a small sanctum sanctorium inside the temple. Within a matter of ten days Lord Krishna was duly installed and consecrated. The priests from The Parthasarathy Temple in Triplicane volunteered to do the idol installation in the manner that is to be done as per the Hindu temple tradition. My guru did not have enough financial resources to do any of this and yet everything happened with perfect precision. This is not only a miracle but a show of love and acknowledgement on the part of Lord Krishna towards his ardent devotee, my guru. Even as a child he could never see others suffer and go his way. He always helped others in whatever way he could. He would share his food with the neighbouring kids who did not have any. While working as an assistant director he would share his food with two others like himself. But some how tragedy strikes people who are already going through a difficult life. There was a lock out in his company and the management retrenched hundreds of employees. He was one of those who lost their job. He was only forty two years old then. At the same time his wife was diagnosed as having a severe heart ailment. Her valves were not functioning properly. It was a big blow to the family. He has two daughters and one son. Understanding the gravity of the situation he quickly conducted the marriage of his eldest daughter to his wife’s brother’s son. His second daughter is the one who is taking care of his wife round the clock till today.His wife has been admitted in the ICU several times in the past ten years in very critical conditions, yet came back home recovered. This is nothing short of miracle through the grace of Lord Krishna. But she has to be on oxygen 24/7. So other complications ensue. She has been bedridden for the past ten years. This has not deterred mu guruji from his service to the society. In fact it has only increased during this period. He has been conducting sloka classes, bhajan classes and moral value educational classes for children for the past ten years. He goes to various places and conducts classes to groups of children. He has created a trust called Sri Gokula Bhatha Bhajana Sabha. He conducts yearly competitions in Thirupavai, Prabantham, story telling and fancy dress among children. This competition attracts more than hundred and fifty participants every year. He has also instituted a rolling shield to be given to a child who is an all rounder. He conducts BalaVihar classes in Bala Mandir on Sundays, a home started by Sri Kamarajar for children who have lost their parents. He will provide them with new clothes and good lunches when ever possible. He is a strict disciplinarian but while teaching to kids he will play with them, bring himself to their level, and make them learn with ease. The children there just love him. He has truly dedicated his life to the upliftment of children. He has gone by foot to Tiruppathi fourteen times. Every month he visits Ahobilam in Andhra Pradesh on Lord Lakshmi Narasimha’s star Swathi. He does not go alone but takes with him a group of people who are interested in going to such temples. Of the 108 Vaishnavaite Divya Desams he is yet to visit only three more temples. I pray to the almighty to bless him to complete it. He has done all this, while taking care of his invalid wife. He is not affluent. After he lost his job in Hydraulics Ltd he has immersed himself in service to God and children and not taken up any other job. His son now works for a multinational bank in a very good capacity. He is to be married soon. His other daughter is yet to be married. He has not passed SSLC. But he has widened his knowledge by reading the books of great writers in Tamil. He is a great admirer of Kalaingar Karunanidhi for his prowess in Tamil literature.He will quote from memory excerpts from various writings. Such is his passion for the language. He learnt all the songs in Nalayira Divya Prabantham by his own effort. His love for the language and Lord Krishna made him master the Azhwar’s pasurams sung in chaste Tamil. When he starts explaining he can speak about a single word or a single line from the poems for more than an hour uninterrupted. Such is his knowledge and talent. He is a little different from the other spiritual speakers in that he does not give word meanings to spiritual verses but relates the present day life style to what is stated in Gita which Krishna spoke in Dwapara Yuga and azhwar pasurams which was created several hundred years ago. He lives among the poor and down trodden and works for them. So he expresses himself in simple ways so that people around him feel free to seek his help and benefit from his knowledge. He can assess one’s spiritual level just by seeing or speaking to them. He avoids unnecessary confrontations with other factions which shows his spiritual maturity. He has a captivating voice which will awaken any soul which is drowning in a quagmire of worldly desires. It is always interesting to listen to him as he will narrate events of our every day life as a part of his lecture. This capacity to lecture is a boon given to him by Krishna. Rain or shine he will be present to conduct classes. This brings pleasure to him as he sees Lord Krishna in this service. When he talks about Saradha Devi and Andal his eyes will well up with tears. He has such compassion. So many spiritual leaders, knowledgeable teachers have graced our land. How many have taken it upon themselves to walk through the poorer sections to help the down trodden and enlighten them? My mother and myself belong to the Brahmin community. We first learnt Prabantham from him and now we are learning Gita. We are his devoted students. He does not belong to the so called upper class but the knowledge and integrity he possesses makes him a cut above all. I am mentioning this just to make a point that caste does not make a man superior or inferior. It is only the character which makes a man gain respect in a society. He would mention about how Sri Ramanujar stood on top of the temple wall and announced the Thirumanthiram Aum Namo Narayana to the world, regardless of the fact that he could go to hell for doing so. He would add that if Sri Ramanujar had not done that for the benefit of people like him, how would he have known the value of the divine mantra and the benefits of following Vaishnavism. Sometimes such candid remarks by him drives a point deep into your heart to really understand the caste system. I join my guru in singing Pallaandu to Sri Ramanujar. He always says that Veda is nothing but our life’s experience. According to him Dharma is doing one’s stipulated duty. This simply leads to salvation. He will answer with absolute ease any difficult question posed to him. Most importantly he will make us think. His advice to his students is to be always independent. As per his guru’s instruction, if a student does not attend his class he takes the iniative to go and find out the reason for his absence and also find a solution to the problem which prevents the child from attending. Teaching is not just a job for him but his life’s mission. His temple is in Kakkan Colony in Kodambakkam High Road, Nungambakkam. Though a small temple it will always be spotless. Krishna and Ganesha will always be beautifully decorated and Puja done regularly. 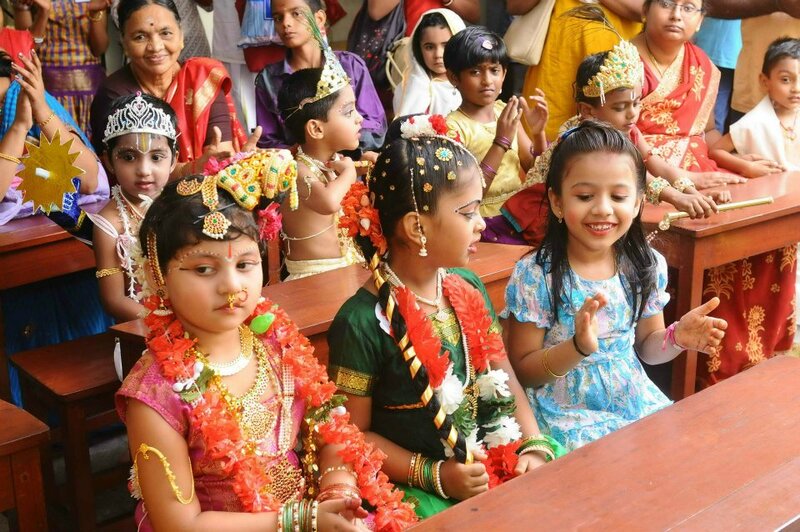 All festivals pertaining to Krishna and Ganesha will be celebrated with love and sincerity. He always gives importance to Annadhanam in all festivals. Food is the only God to a hungry person. Purattasi Saturdays, everyday in the month of Margazhi, during Navaraththiri and even during the hot summer afternoons he provides food and buttermilk to people in his neighbourhood as Prasadham. He is around fifty six years old now. Many of his students are in good position now and help him during festivals. You see young girls and boys surrounding him during such times calling him anna and doing all the work for him. It is nothing but the return of pure love. He is very adept in bringing out the talents in his students. He follows the path of truth. He loves his wife very dearly. She is the source of strength for him. Even though he has studied the Gita and is teaching the same, he is saddened to see his wife go through so much suffering. Those who know him will agree with me one hundred percent regarding what I have written about him. I want every one to know about him. Even in this Kali Yuga we are lucky to have people like him around us. My mother and I are so blessed to have him as our guru. I only pray to Lord Krishna to bless him, his family, his community where he does service, his students and all those with whom he comes into contact with. In fact it is Lord Krishna’s duty to do so. என்னுடைய குரு திரு.வெண்மணி K.குமார், அன்புடன் குருஜி, அல்லது இன்னும் சுருக்கமாக ஜி! இவரைப் பற்றி அறிந்து கொள்ள ஆரம்பித்தவுடன் அடங்காத பிரமிப்பு நம்மை ஆட்கொள்ளும்! இவர் மிக மிக ஏழை குடும்பத்தில் பன்னிரெண்டு பிள்ளைகளில் ஐந்தாவது பிள்ளையாகப் பிறந்தவர். தந்தை படிக்காதவர். அதிர்ஷ்டவசத்தால் சென்னை தொலைபேசி அலுவலகத்தில் வேலை கிடைத்துக் குடும்பத்தை சிரமத்துடன் நடத்தி வந்து இருக்கிறார். தாய் தன் பங்கிற்குக் கட்டிட வேலை செய்து குழந்தைகளைப் பராமரித்திருக்கிறார். தந்தை மிகவும் கண்டிப்பானவர்! கடவுள் பக்தியும் நிறைந்தவர். அவருக்குப் பிறந்த என் குருவோ நாத்திகவாதி. தந்தை, தான் படிக்காததால் மகனை நல்ல முறையில் படிக்கவைக்கவேண்டும் என்று ஆசைப்பட்டிருக்கிறார். ஆனால் மகனுக்கோ படிப்பில் சிறிதும் நாட்டமில்லை. தர்க்கவாதம் புரிவதில் வேறு சிறந்து விளங்கினார். அதனால் கோபித்துக் கொண்டு வீட்டை விட்டு வெளியேறி பலவகை வேலைகளைச் செய்து பார்த்திருக்கிறார். பள்ளியில் படிக்கும்பொழுதே நாடகம் எழுதி நடித்திருந்த அனுபவமும் ஈடுபாடும் இருந்ததால் அன்னாளில் கோடம்பாக்கத்தில் அடைக்கலம் புகுந்தார். எடுபிடியாக, காபி ரைட்டராக, துணை இயக்குனராக, என்று அவர் பார்க்காத வேலையில்லை. அப்பொழுது சந்தர்ப்பவசத்தால் யுனியன் மோடார்ஸில் வேலைக்கு மனுப் போட்டு அவர்களின் இன்னொரு கம்பெனி ஆன ஹைட்ராலிக்ஸ் லிமிடடில் வேலையும் கிடைத்துவிட்டது. அது அவர் வாழ்வில் ஒரு திருப்புமுனை. நிரந்தர வேலை கிடைத்து சமூகத்தில் ஒரு அந்தஸ்து வந்தது. தந்தை இது தான் சமயம் என்று உடனே கால் கட்டுப் போட்டுவிட்டார். மனைவி கிடைப்பதெல்லாம் இறைவன் கொடுத்த வரம் என்பது இவர் வாழ்வில் உண்மையானது. பின்னாளில் இவர் பலருக்கு அறிவுக்கண்ணை திறந்து வைப்பார் என்றறிந்தே கலைவாணி என்ற பெயருடையவர் இவர் வாழ்க்கை துணையானார். இன்றும் இவர் வசிப்பது நுங்கம்பாக்கத்தில் தன் தந்தை குடியிருந்த குடிசை வீட்டை மாற்றி தன் செலவில் கட்டிய சிறிய குடியிருப்பில் தான். கல் கட்டிடமாக மாற்ற கடன் வாங்க வேண்டியிருந்ததால், அவர் சம்பளத்தில் பெரும்பங்கு அன்று கடனை அடைப்பதில் சென்றும் இவர் மனைவி இவர் கொடுக்கும் பணத்தில் பாங்குடன் குடும்பம் நடத்தியுள்ளார். இவர் அப்பரண்டிஸ்ஸாக இருந்தபோது ஓரங்க நகைச்சுவை நாடகம் ஒன்றை அலுவலக விழாவில் அரங்கேற்றி அனைவரின் நன்மதிப்பையும் பெற்றார். இது அவருக்கு ஒரு தன்னம்பிக்கையை ஊட்டியது. என்றுமே அவர் மனதில் பட்டதை அப்படியே சொல்லும் குணம் உடையவர். யாருக்கும் அஞ்சாதவர். தான் வளர்ந்த இடத்தில் தன்னைச் சுற்றியுள்ள அனைத்து தரப்பினரும் மிகவும் ஏழையாகவும், படிப்பின் முக்கியத்துவம் அறியாதவர்களாகவும், பல தீய பழக்கங்களைக் (குடிப்பது, புகை பிடிப்பது) கொண்டவர்களாக இருந்தாலும் தந்தையின் கண்டிப்பான வளர்ப்பின் காரணமாக இவர் ஒழுக்கத்தின் முக்கியத்துவம் உணர்ந்து வளர்ந்தார். எந்தத் தீய பழக்கத்துக்கும் அடிமையாகவில்லை. இது சாதரணமாக நடுத்தர அல்ல உயர் குடி மக்களுக்கு பெரிய விஷயமாகத் தோன்றாது. ஆனால் குடிசைப் பகுதியில் தூயவராக வளரக் காரணம் இவர் தந்தையே என்பதை இன்றும் பெருமையுடன் நினைவு கூர்கிறார். இந்த சமயத்தில் இவருடன் வேலை பார்த்த திரு.மன்னு பெருமாள் என்பவர் இவர் மேல் ஒரு நல்ல தாக்கத்தை ஏற்படுத்தினார். இவருக்கு ஒரு வழிகாட்டியாக விளங்கினார். திரு. பெருமாள் திருப்பதிக்கு பாத யாத்திரை ஏற்பாடு செய்து குழுக்களாக அழைத்துச் செல்வாராம். ஆன்மிகத்தில் நாட்டம் ஏற்பட வைத்து நல்ல மார்க்கத்தில் இவர் மனதை திருப்பிய இவரைத்தான் தன் முதல் குருவாகக் கருதுகிறார் என் குரு. ஒரே கணத்தில் இவர் நாத்திகத்தில் இருந்து ஆத்திகத்துக்கு மாறியுள்ளார். அந்த கணம் என்னவென்று எனக்குத் தெரியாது. ஆனால் பெரியார் கருத்துக்களை மேடையில் பிரசங்கம் செய்தவரை கண்ணன் ஒரே கணத்தில் ஆட்கொண்டு விட்டான். எவ்வளவுக்கெவ்வளவு நாத்திகத்தைப் பற்றி பேசினாரோ அவ்வளவுக்கவ்வளவு ஆத்திகத்தில் ஈடுபட ஆரம்பித்தார். அவருடைய இந்தத் தேடல் பல குருமார்களை நாடிச் சென்று அவர் சந்தேகங்களுக்கு விளக்கம் பெற வைத்தது. சின்மயா மிஷன், ராமகிருஷ்ண மடம், இஸ்கான், போன்ற சமய நிறுவனங்களில் தன் கேள்விக்கு விடை கிடைக்காதபோது மலை, காடு என்று சுற்றி அங்கிருக்கும் சித்தர்களிடமும் உபதேசம் பெற்றுள்ளார். இவருக்குக் கண்ணன் மேல் அளவில்லாக் காதல். இவரின் அன்பு ஆழ்வார்களின் அன்புக்கு இணையானது. இவருடைய நோக்கமே சமூகப் பணி தான். ஆனால் ஆரம்பித்தது என்னமோ சமயப் பணியாகத் தான். இவரின் இருப்பிடம் கோடம்பாக்கம் ஹை ரோடில் சட்டிப் பானைகள் விற்பனை செய்யும் இடத்திற்கு வெகு அருகில். அங்குள்ள குழந்தைகளின் முன்னேற்றம் தான் இவரின் முதல் இலக்காக இருந்தது.. தன் முயற்சியாலும், தமிழின் மேலும் கண்ணனின் மேலும் உள்ள அதீத ஈடுப்பாட்டினாலும் முதலில் திருப்பாவை பயின்று பின் நாலாயிர திவ்ய பிரபந்தத்தையும் கற்றுக் கொண்டார். பின் அதைக் குழந்தைகளுக்கு அவர்களுக்குப் புரியும் வகையில் சொல்லிக் கொடுக்க ஆரம்பித்தார். குழந்தைகளை ஈர்க்க தின்பண்டங்கள் முதலியன கொடுத்து அவர்களை வகுப்பிற்கு வரவழைத்தார். அப்படியும் அந்தப் பகுதிக் குழந்தைகளை தொடர்ந்து வரவழைப்பது பிரம்ம பிரயத்தனமாக இருந்தது. ஆனாலும் மனம் தளராமல் அந்தப் பகுதி மக்களுக்கு தன்னால் இயன்ற உதவிகள் செய்து அங்கிருப்போரின் நன் மதிப்பைப் பெற்றார். அவர் இன்றும் அன்பும் மரியாதையும் வைத்து வணங்குவது தன்னுடைய அடுத்த குருவான திரு. ஈஸ்வரன் அவர்களை. அவர் ஒரு சிவனடியார். துறவறத்தை மேற்கொண்டவர். என் குருவின் புதைந்து கிடக்கும் ஆற்றலை இன்றும் தூண்டி விட்டுக் கொண்டிருப்பவர் இந்த எளியவர் தான். நான் இவரை சந்தித்து இருக்கிறேன். கருணை நிறைந்தவர். அவரிடம் சைவ சித்தாந்தத்தையும் சைவ திருமறைகளையும் பயின்றுள்ளார். (ஆனால் இவருக்கு எல்லாம் கண்ணனே) குருவுக்குக் காணிக்கையாக கொடுக்க அவரிடம் ரொம்பப் பணம் இல்லை. அந்த சமயத்தில் வீட்டின் மிக அருகில் ஒரு பிள்ளையார் கோவில் மிகவும் பாழடைந்த நிலையில் இருந்ததைப் பார்த்து மிகுந்த வருத்தத்துடன் தன் குருவிடம் அது பற்றி சொல்லியிருக்கிறார். உடனே அவருடைய குரு எனக்கு குரு தக்ஷணையாக ஏதாவது கொடுக்க வேண்டும் என்று நீ நினைத்தால் அந்தக் கோவிலை எடுத்து நித்ய கைங்கர்யங்களை செய்ய ஆரம்பி என்று சொல்லியிருக்கிறார். குருவின் சொல்லைத் தட்ட முடியாமல் வேலைக்கும் போய் கொண்டு தினப்படி பூஜை காரியங்களை செய்ய ஆரம்பித்துள்ளார். அந்தக் கோவிலை முதலில் சீர் படுத்தவே ரொம்ப கஷ்டப்பட்டு இருக்கார். அடை அடையாகக் கம்பளி பூச்சிகள் வினாயாகர் விக்ரகத்தையே மறைத்தபடி சூழ்ந்திருந்தன. உத்திரத்தில், சுவரில் என்று எல்லா இடங்களிலும் கம்பிளி பூச்சிகள். அவற்றையெல்லாம் சுத்தம் செய்து, சூதாடுபவர்களின் மையமாக இருந்த அந்த இடத்தைத் தூய்மை படுத்தினார். அவருடைய சொற்ப வருமானத்தில் இந்தக் கோவில் பராமரிப்பும் சேர்ந்து அவர் பளுவை அதிகமாக்கியது. அப்பொழுது அந்தக் கோவில் வழியே தினமும் சென்ற வந்த திரு.எம்ஜியாரின் மைத்துனர் (திருமதி ஜானகியம்மாவின் சகோதரர்) என் குருஜியின் முயற்சியால் மாசு களையப்பட்டு கோவில் படிப்படியாகப் புனிதமடைந்ததைக் நேரில் கண்டு அவருக்கு உதவ முன் வந்துள்ளார். அவர் இவருக்கு மாதா மாதம் கோவில் பராமரிப்புக்கு என்று இருநூறு ரூபாய் கொடுத்து உதவியுள்ளார். இதுவும் அவர் உழைப்புக்குக் கிடைத்த வெகுமதி என்றே சொல்லலாம்.. கோவிலுக்கு அப் பகுதி மக்கள் வர ஆரம்பித்தனர். உண்டியலில் சொற்பப் பணம் சேர்ந்தவுடன் அந்தக் குடிசைப் பகுதியில் இருந்த சில தாதாக்கள் இவரிடம் இருந்து அந்த பணத்தை பறிக்க எண்ணி தொந்தரவு செய்ய ஆரம்பித்தனர். ஆனால் எதற்கும் அஞ்சாத இவர் அவர்களிடம் பேச வேண்டிய விதத்தில் பேசி கோவில் பணத்தை கோவில் திருப்பணிக்கே செலவிட்டு வந்தார். அந்த சமயத்தில் திரு.எம்ஜியார் முதலமைச்சர் ஆக இருந்ததும் அவருக்கு ஒரு விதத்தில் உதவியாக இருந்தது ஏனென்றால் அவர்கள் இவரிடம் ரொம்ப வம்பு செய்யாமல் இருந்தனர். இஸ்கானைச் சேர்ந்த பரமேஸ்வர பிரபுவிடம் இவர் முதலில் கீதை பயில ஆரம்பித்தார். இஸ்கானில் கடை நிலை ஊழியராகப் பணியாற்றி குருவிடம் பாடம் பயின்றார். இவருடைய இன்னொரு குரு திரு. ராமகிருஷ்ணன். அவர் பெரிய பதவியில் இருந்தவர். அவரின் ஒரே மகன் அகால மரணம் அடைந்ததும் கணவனும் மனைவியும் வீட்டை விட்டு எங்கும் செல்லாமல் வீட்டினுள்ளே முடங்கிக் கிடந்தனர். அப்பொழுது ராமகிருஷ்ண மடத்தின் சுவாமிஜி ஒருவர் அவர்கள் வீட்டிற்கே சென்று அவர்களுக்கு கௌன்சிலிங் அளித்து அவர்களை பொதுச் சேவையில் ஈடுபட வைத்தார். அவரிடம் என் குருஜி பகவத் கீதை பயின்றார். அவருக்குக் கீதை பயில்வது முதலில் மிகவும் கடினமாகத் தான் இருந்தது. என் குருவுக்கு அப்பொழுது சமஸ்க்ரிதம் தெரியாது, இரண்டாவது திரு. ராமகிருஷ்ணன் ஆங்கிலத்திலும் நிறைய விளக்கங்கள் அளிப்பார். இரண்டுமே இவருக்கு புரிந்துக் கொள்ளக் கடினமாக இருந்தது. ஆனால் விடா முயற்சியுடன் பயின்றார். கண்ணனின் திருவருளாலும் அவர் குருவின் ஆசியாலும் கீதையின் முழு அர்த்தத்தையும் உள் வாங்கிக் கொண்டார். இவரால் பலர் பயனடைய வேண்டும் என்பது கண்ணனின் திருவுள்ளம் ஆயிற்றே! இவர் பிள்ளையார் கோவிலில் உட்கார்ந்து கொண்டு பிரபந்தம் சேவித்துக் கொண்டும் கண்ணன் மேல் பஜனைப் பாடி வருவதைப் பார்த்த ஒரு பக்தர் ஒரு நாள் அவரை அழைத்துக் கொண்டு மகாபலிபுரம் சென்று அங்கு ஒரு சிற்பக் கல்லூரியில் இருந்து இவருக்குப் பிடித்த கிருஷ்ண விக்கிரகத்தை தேர்வு செய்யச் சொல்லி, ஒரு சில மணி நேரங்களில் கிருஷ்ணனை அந்த சிறிய பிள்ளையார் கோவிலுக்கு கொண்டு வந்துவிட்டார். என் குருஜி வேறு ஒரு பக்தரின் உதவியை நாடி, அவர் செலவில் ஆகம விதிப்படி கிருஷ்ணன் பிரதிஷ்டை செய்யப்பட்டு பத்து நாளைக்குள் கும்பாபிஷேகமே நடைபெற்று விட்டது. இதை ஒரு அற்புத நிகழ்வு என்றே கொள்ளலாம். என் குருவிடம் இவ்வளவு பெரிய காரியத்துக்கு சிறிதும் பணம் இல்லாமல் இருந்தும் கட்டிட வேலைகள் தானே நடந்தன, பிரதிஷ்டை செய்ய திருவல்லிக்கேணி பார்த்தசாரதி பெருமாள் கோவில் பட்டாச்சார்யர்களின் உதவியும் தானே அமைந்தன! இதுவே கண்ணனின் கருணை. என் குருஜியின் கிருஷ்ணப் பிரேமைக்குக் கண்ணன் கொடுத்த அங்கீகாரம். சிறு வயது முதலே இவருக்கு மற்றவர்கள் படும் துன்பத்தை பார்த்து உதவி செய்யாமல் இருக்க முடியாது. சிறுவனாக இருந்த போது தனக்குக் கிடைத்த உணவை குடிசைப் பகுதியில் உணவு கிடைக்காத மற்ற சிறுவர்களுடன் பகிர்ந்து கொள்வார். உதவி இயக்குனராக இருந்த போதும் ஒரு சாப்பாட்டை வாங்கி இன்னும் இருவருக்குப் பங்கு பிரித்துக் கொடுத்து பின் உண்ணுவார். ஆனால் நல்லவர்களுக்குத் தான் சோதனை அதிகம் வரும் என்ற கூற்றை மெய்ப்பிப்பது போல இவர் வாழ்வில் பல துன்பங்களை அனுபவித்து விட்டார். திடீரென ஹைட்ராலிக்ஸ் லிமிடடில் கதவடைப்பு ஏற்பட்டு நூற்றுக் கணக்கில் தொழிலாளிகள் வேலை இழந்தனர். அதில் இவரும் ஒருவர். அப்பொழுது அவருக்கு நாற்பத்திரண்டு வயது தான். அதே சமயம் அவருக்கு உற்றத் துணையாக இருந்து வந்த அவர் மனைவிக்கு இதய நோய் தாக்கியது. இரண்டு மகள்கள், ஒரு மகன். வேலை போன இத் தருணத்தில் ஒரு பெரிய இடியாக மனைவியின் நோய் இவர்கள் குடும்பத்தை தாக்கியது. இதய வால்வுகள் பழுதடைந்ததால் மூச்சு விடுவதற்கே மிகுந்த சிரமப்பட்டார். மூத்த மகளுக்கு உறவிலேயே விரைவில் மணம் முடித்தார். இரண்டாவது மகள் தான் இன்றுவரை தாயை அன்புடன் பராமரித்து வருகிறார். அவர் மனைவி பலமுறை ICUவில் அனுமதிக்கப்பட்டு கைவிடப்பட்ட நிலையிலும் உடல் நலனில் முன்னேற்றம் ஏற்பட்டு வீடு திரும்புவார். இதுவும் இன்னொரு அதிசயமே. ஆனாலும் இருபத்துநாலு மணிநேரமும் செயற்கை சுவாசத்தின் உதவியோடு தான் வாழ வேண்டிய நிலை. அதனால் பல இன்னல்கள். பத்து வருடத்திற்கு மேலாகப் படுத்தப் படுக்கையாக உள்ளார். ஆனால் என் குருஜி இதனால் எல்லாம் பொதுச் சேவையில் இருந்து விலகிக் கொள்ளவில்லை. இன்னும் சொல்லப் போனால் இத்தனை இடர்களுக்கு நடுவிலும் அவர் ஆன்மிகப் பணி அதிகரித்தே உள்ளது. அவர் கடந்த பத்து வருடங்களாக ட்ரஸ்ட் (ஸ்ரீ கோகுல பக்த பஜன சபா) ஒன்றை ஆரம்பித்து குழந்தைகளுக்குத் தன்னால் முடிந்த வரை ஸ்லோக வகுப்புகளும் அறநெறியை பயிற்றுவிக்கும் வகுப்புகளும் நடத்தி வருகிறார். வேறு வேறு இடங்களுக்குச் சென்று வகுப்புகள் நடத்துகிறார். வருடா வருடம் மார்கழி மாதத்தில் திருப்பாவை/பிரபந்தப் போட்டி, மற்றும் குழந்தைகளை ஈர்க்கும் மாறுவேடப் போட்டி, கதைப் போட்டி, ஆகிய போட்டிகளைத் தவறாமல் நுங்கம்பாக்கம் பகுதியில் நடத்தி வருகிறார். தேனாம்பேட்டையில் தாய் தந்தையற்ற குழந்தைகளுக்காக திரு. காமராஜர் அவர்கள் ஆரம்பித்து வைத்த பால மந்திர் பள்ளியில் இவர் ஞாயிற்றுக் கிழமைகளில் வகுப்புகள் நடத்துகிறார். இது எவ்வளவு பெரிய சேவை! அவர் குழந்தைகளுக்காகவே தன்னை அர்ப்பணித்துக் கொண்டுள்ளார். மிகவும் கண்டிப்பானவர், ஆனால் குழந்தைகளுக்குப் பயிற்றுவிக்கும் போது அவர் குழந்தைகள் அளவுக்கு இறங்கி அவர்களுக்கு இணையாக விளையாடி அனைத்தும் கற்றுத் தருவார். சுமார் பதினாலு முறை திருப்பதிக்கு பாத யாதிரைச் சென்றுள்ளார். மாதம் தவறாமல் ஒவ்வொரு சுவாதி நக்ஷத்திரத்திரம் அன்று ஆந்திராவில் உள்ள அஹோபிலம் சென்று வருவார். அவர் மட்டும் செல்லாமல், தன்னைச் சுற்றியுள்ளவர்களில் எவ்வளவு பேரை அழைத்துச் செல்ல முடியுமோ அவ்வளவு பேரைக் கூட்டிச் செல்வார். நூற்றியெட்டு திவ்ய தேச யாத்திரையில் இன்னும் மூன்று இடங்கள் தான் இவர் நேரில் சென்று தரிசிக்கவில்லை. அதுவும் இறையருளால் நடந்துவிடவேண்டும் என்று அந்த பரந்தாமனை நான் பிரார்த்தித்துக் கொள்கிறேன். இவையத்தனையும் ஒரு நோயாளி மனைவியை வைத்து பராமரித்துக் கொண்டு செய்துள்ளார். மேலும் பணத்தால் செல்வந்தர் அன்று. அவருக்கு ஸ்டேண்டர்ட் மோட்டார்ஸில் வேலை போன பிறகு அவர் இறைசேவை/குழந்தைகள் சேவையில் தன்னை முழுமையாக அர்ப்பணித்துக் கொண்டு விட்டார். மகன் இப்பொழுது பன்னாட்டு நிறுவன வங்கியில் நல்ல வேலையில் உள்ளார். விரைவில் அவர் திருமணமும் நடக்கவிருக்கிறது. 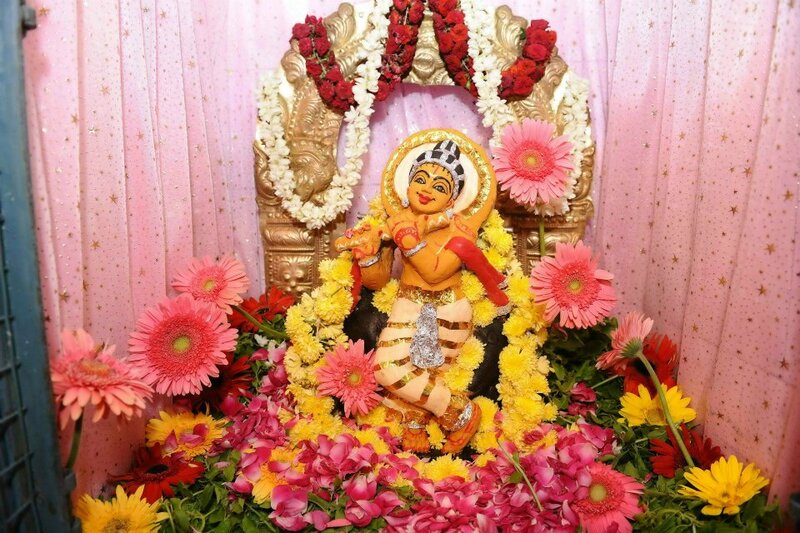 இன்னுமொரு மகளுக்குத் திருமணம் செய்விக்க வேண்டும். SSLC தேர்வில் வெற்றிப் பெறாதவர், தமிழ் அறிஞர்கள் நூல்கள் பலவற்றைப் படித்து தன் சிந்தனையை வளப் படுத்துக் கொண்டவர். கலைஞர் கருணாநிதியின் தமிழுக்கு அவர் அடிமை. தமிழில் அப்படி ஒரு ஆர்வம். அனைத்துத் தமிழ் எழுத்தாளர்களின் எழுத்துக்களில் இருந்து மேற்கோள்கள் காட்டுவார். தன் சுய முயற்சியால் நாலாயிர திவ்யபிரபந்தத்தைப் பயின்றுள்ளார். அவர் எந்த ஒரு பாடலையோ செய்யுளையோப் பற்றி பேச ஆரம்பித்தால் மடை திறந்த வெள்ளம போல் ஒரே ஒரு வாக்கியத்திற்கு ஒரு மணி நேரத்திற்கும் மேலாக வியாக்கியானம் செய்ய அவரால் முடியும். அதுவும் கேட்பதற்கு மிக மிக சுவாரஸ்யமாக இருக்கும். மற்ற ஆன்மிகச் சொற்போழிவார்கள் போல் பாடலின் வரிகளுக்கு அர்த்தம் சொல்லுவது அவர் பாணியில்லை. எத்தனையோ ஆண்டுகள் முன் ஆழ்வார்கள் அருளிச் செய்த பிரபந்தப் பாசுரங்களையும், துவாபர யுகத்தில் கண்ண பரமாத்மா அளித்த கீதையையும் இன்றைய சமூகச் சூழலுக்கு ஏற்றாற்போல் தற்போதய உதாரணங்களுடன் விளக்கிச் சொல்வார். அவர் ஏழை எளியவர்கள் மத்தியில் வாழ்பவர் அவர்களுக்காகவே சேவை செய்பவர். அவர்களிடம் இவர் தன் மேதாவிலாசத்தைக் காட்டினால் அவர்கள் இவரிடம் நெருங்க மாட்டார்கள். இவரோ அவர்களின் வாழ்க்கைத் தரம் உயர வேண்டும் என்பதற்காகவேப் பாடுபடுபவர். அதனால் அவரவர் அறிவுத் தகுதிக்கு ஏற்ப தன்னை இறக்கிக் கொண்டு அவர்களுக்குப் புரியும் வண்ணம் சொல்லுவார். பார்த்தவுடனே ஒருவரின் ஆன்மீக வளர்ச்சியை கண்டறியும் திறன் அவரின் பலம். வேண்டாத விஷயங்களில் இருந்து விலகியே இருப்பதும் இவரின் ஆன்மிக முதிர்ச்சிக்கு இன்னுமொரு எடுத்துக் காட்டு. அவருக்கு இருக்கும் கணீர் குரலில் பிரசங்கம் செய்ய ஆரம்பித்தால் தாமச குணத்தில் மயங்கிக் கிடக்கும் எந்த ஒரு ஆத்மாவும் வாரி சுருட்டிக் கொண்டு எழுந்திருக்கும். இது கண்ணன் அவருக்குக் கொடுத்திருக்கும் ஒரு வரம். மழையோ வெயிலோ வகுப்பெடுக்க வந்துவிடுவார். ஏனென்றால் இதை அவர் வேலையாகக் கருதுவதில்லை, இறை சேவையாக எண்ணுகிறார். பாடம் நடத்துவதில்லேயே அவர் கண்ணனைக் காணுகிறார். ஆழ்வார்களில் ஆண்டாளைப் பற்றிப் பேசும்போதும் உருகிவிடுவார். அன்னை சாரதா தேவியை பற்றிப் பேசும்போது உருகிவிடுவார். உண்மையை உணர்ந்த இளகிய மனது அவருக்கு. எத்தனையோ சான்றோர்கள், அறிஞர்கள், ஞான குருக்கள், அவர்களில் மேல் குடியில் பிறந்தவர்கள் அனேகம் பேர். அவர்களில் எத்தனை பேர் சேரிப் பகுதியில் சென்று நாராயணன் நாமத்தின் மேன்மையை பரப்பியுள்ளார்கள்? நானும் என் தாயாரும் அந்தணர் குலத்தைச் சேர்ந்தவர்கள். இவரிடம் முதலில் பிரபந்தம் பயின்றோம். இப்பொழுது கீதை பயிலுகிறோம். இவரின் பரமார்த்த சீடர்கள். இவர் பிறப்பால் முதலாம் வர்ணத்தவர் அன்று. இவரின் பக்திக்கும் ஞானத்திற்கும் முன்னே பிறப்பால் எக்குலத்தவர் ஆயினும், எவரும் இவரை விட உயர்ந்தவராக இருக்க முடியாது என்பதே என் கருத்து. ஸ்ரீ ராமானுஜரைப் பற்றிப் பேசும் போது என் குரு, அவர் மட்டும் நாராயண திருமந்திரத்தை, மதில் மேல் நின்று உலகுக்குச் சொல்லாவிடில் என் போன்றோர் வைணவத்தின் பெருமையை உணர்ந்து திருமால் மேல் பற்று கொண்டிருக்க முடியுமா என்று கேட்கும்போது அன்று அவர் செய்த சேவையின் மகத்துவத்தை இன்று நான் சிறிதாவது உணருகிறேன். தான் நரகமே சென்றாலும் உலகம் உய்ய வேண்டும் என்ற ஸ்ரீ ராமானுஜருக்குப் என் குருவுடன் சேர்ந்து நானும் பல்லாண்டு பாடுகிறேன். வேதம் என்று தனியாக ஒன்றும் கிடையாது. நம் வாழ்க்கை அனுபவமே வேதம் என்பார் என் குரு. கர்மாவைப் பற்றிப் பேசும் பொழுது நம் குல தர்மத்தை கடை பிடித்து அதன் படி நடப்பதே இறைவனை அடையும் எளிய மார்க்கம் என்பார். எந்தக் கடினமாகத் தோன்றும் புரியாத ஆன்மிக விஷயங்களுக்கும் கேட்டவுடன் விளக்கம் அளிப்பார். முக்கியமாக நம்மை சிந்திக்க வைப்பார். தன் மாணவர்கள் சுயமாகச் சிந்தித்து சொந்தக் காலில் நிற்பதைத் தான் இவர் முதன்மையாகப் பயிற்றுவிக்கிறார். இவர் குருவின் ஆணைப்படி தன் வகுப்புக்கு வராத மாணவர்கள் இல்லங்களுக்கேச் சென்று எந்த பிரச்சினையினால் அவர்கள் வரவில்லை என்பதை அறிந்து, அதற்கு தக்கத் தீர்வையும் தந்து அந்த மாணவனை தொடர்ந்து வகுப்புக்கு வரவழைப்பார். அவருக்கு ஆசிரயராக இருப்பது ஒரு வேலையன்று, அது அவருக்கு ஒரு வேள்வி! கோடம்பாக்கம் ஹை ரோடில் கக்கன் காலனியில் உள்ளது இவர் சேவை செய்யும் சிறிய கோவில். மிகவும் சுத்தமாக இருக்கும். விநாயகருக்கும் கிருஷ்ணனுக்குமான எல்லா பண்டிகைகளும் இந்தக் கோவிலில் கொண்டாடுவார். பூஜையூம் அலங்காரமும் அவ்வளவு நேர்த்தியாக இருக்கும். எல்லா பண்டிகைகளிலும் இவர் முக்கியத்துவம் கொடுப்பது அன்னதானத்திற்கே. பசித்தவனுக்கு உணவே தெய்வம். அதை பூர்த்தி செய்யாமல் ஆன்மிகப் பணி தொடங்கவே முடியாது. முடிந்த அளவு புரட்டாசி மாத சனிக்கிழமைகளில், மார்கழி மாதங்களில், நவராத்திரி காலத்தில் என்று எந்த ஒரு முக்கிய நிகழ்வின் போதும் இறைவனுக்கு அமுது படைத்து அதை அடியார்களுக்கு வழங்குவதிலேயே அவர் ஆனந்தம் காண்பார். ராம நவமியை தொடர்ந்து கோடை காலத்தில் மதியம் நீர் மோர் வழங்குவார். 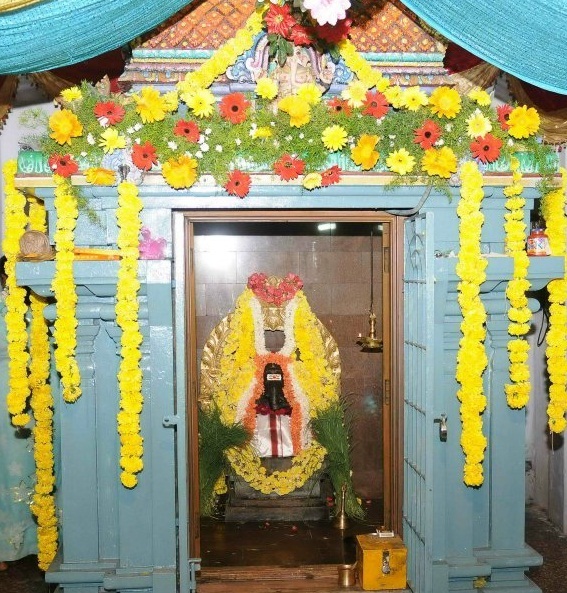 அவருக்கு இப்பொழுது ஐம்பத்தியாறு வயதிருக்கும். அங்கு அவரிடம் பயின்ற பிள்ளைகள் இப்பொழுது வேலைக்குச் சென்று நல்ல நிலையில் உள்ளனர். அவர்களில் பலரும் விழாக்களின் போது உதவி செய்ய வந்து விடுவார்கள். இவரை அன்போடு அண்ணா என்று சிறுவர் முதல் பெரியவர் அழைப்பதே இவரின் அன்பான சேவைக்குக் கிடைத்த அன்புப் பரிசு! இவர் தன்னுடைய மாணவர்களின் திறனை வெளிக் கொண்டு வருவதில் வல்லவர். சத்தியப் பாதையில் செல்பவர். மனைவியின் மேல் அளவற்ற அன்பு வைத்திருப்பவர். எவ்வளவு தான் கீதையை படித்தும், பலருக்கு ஆசானாகக் கற்றுக் கொடுத்தும், அதன் வழி நடந்தும், அவர் மனைவி படும் துன்பத்தை மட்டும் பார்த்துக் கொண்டு அவரால் வருத்தப் படாமல் இருக்க முடிவதில்லை.அவரை சந்தித்துப் பழகியவர்கள் நான் சொல்வதை முழுவதுமாக ஏற்றுக் கொள்வார்கள். இவரைப் பற்றி பலரும் அறிந்து கொள்ள வேண்டும் என்பதே என் ஆசை. இந்த கலி காலத்திலும் இவர் போன்றோர் உள்ளனர். நானும் என் தாயும் என்ன பாக்கியம் செய்தோமோ இவரை குருவாகப் பெறுவதற்கு. இவரும், இவர் குடும்பத்தினரும், சுற்றத்தாரும், மாணவர்களும், நன்றாக இருத்தலே கண்ணனுக்குப் பெருமை. அதுவே என் பிரார்த்தனையும் ஆகும்.